To hop, scroll down or CLICK HERE! When I was a kid, my mom worked evenings, which is why I spent a lot of time with my dad, an avid tennis player and movie buff. This meant, when the weather turned cold and the tennis nets came down, I got to go to the movies. And I don’t mean fluffy Disney films either. I mean, real movies. Once Upon a Time in the West, True Grit, Two Mules for Sister Sara, The Shootist, High Plains Drifter, and The Outlaw Josey Wales. Movies that could put hair on your chest. Even if you were a girl. It was the 70s, and the great American anti-hero had come into his own. It’s no surprise then that, even at a tender age, I began a lifelong love affair with his rugged Western counterpart—John Wayne at the end of his career and Clint Eastwood in his prime. BROKEN VOWS is my homage to the Westerns I grew up on. CLICK HERE FOR MORE LINKS TO THE ROMANCING THE WEST BLOG HOP! 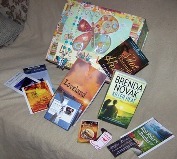 SNEAK PEEK SUNDAY readers, scroll down to my February 24th post for this week’s peek! A big thank you to Sara Walter Ellwood for hosting the Romancing the West Blog Hop from February 22nd to 25th. Thanks also to everyone who stopped by to visit and comment on my February 22nd post about why I love Westerns. It was fun to read about your favorite Western movies, books, and TV shows. Most of those faves are mine too, and a few have put the bug into me to check out some new titles and revisit old classics. The winner of the grand prize for the Romancing the West Blog Hop will be notified by email by 10 p.m. EST on February 26th. Check Sara Walter Ellwood’s Cowboy Charm for details on that. As for the winner of my drawing for a $10 Amazon card, I’m happy to announce that the winner is Susan Frances!